Nephrology is a subfield of medical science dealing with the kidneys; it involves diseases of the kidneys and the study of normal kidney functioning. The kidneys are the two small bean-shaped organs below the rib cage that filter waste products from the blood and produce urine, which is then excreted from the body. Nephrologists are doctors that specialize in nephrology. The word nephrology comes from the Greek words nephros (“kidney”) and -logos “the study of”. The kidneys were known to be vital body organs in ancient times. Mentions of the kidneys are found in Confucius’s writings, the Jewish law book the Talmud, and the Bible and Quran, in which it is implied that the kidneys are important organs that are necessary for well-being. However, the first major development in the field of nephrology is considered to be found in the book Reports of Medical Cases by Richard Bright in 1827. Bright, a physician, described the features of kidney disease in detail in his book. Kidney disease was even called “Bright’s disease” for the next 100 years or so because of Bright’s accomplishment of recognizing it. Though a laboratory diagnostic test for kidney disease was developed, access to it was extremely limited, and there was no treatment or cure. Other developments were made in nephrology in the 19th Century, such as William Howship Dickinson’s description of nephritis (kidney inflammation) and Frederick Akbar Mahomed’s discovery of a correlation between kidney disease and hypertension. However, progress in treating kidney disease slowed until the mid-20th Century. The term “nephrology” itself was not used until the 1960s, having before been called “kidney medicine” instead. Nephology entered modern medicine in 1954, when Drs. John Merrill and Joseph Murray performed the first successful kidney transplant. This operation was an important milestone because it showed for the first time that chronic kidney disease could be cured by implanting a healthy kidney to replace a failing one. The patient in this transplant received a kidney from their identical twin, so it was not rejected by their body. Later, advances in immunology lead to the development of immunosuppressive drugs, which greatly reduced the chance of organ rejection from unrelated donors and made kidney transplants more feasible. Also in the 20th Century, other forms of treatment for kidney failure began to be used. These forms cannot cure kidney disease, but they can help a patient manage it and prolong their life. One such method is hemodialysis, which filters the blood outside the body when failing kidneys cannot effectively do the job on their own. In the past century, kidney disease went from what was essentially an untreatable death sentence to a condition that can be manageable and even curable. Now, the focus is on new research and discoveries that may be used to better treat kidney diseases. Although huge advancements were made in the 20th Century and research progress in the field of nephrology has slowed somewhat since then, new discoveries continue to be made and doctors and researchers are working hard to advance scientific knowledge. Scientific discoveries can come from unexpected places, and nephrology is no exception; for example, in 2017, a study found that a compound in the venom of the green mamba snake may be able to be used in treating polycystic kidney disease. 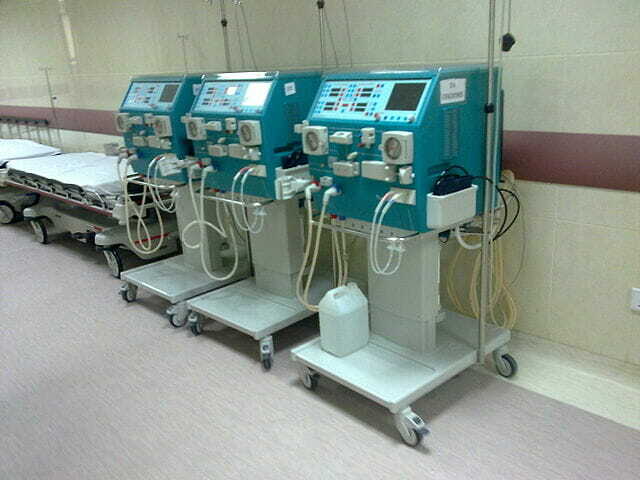 These dialysis machines are used to filter the blood of individuals with kidney disease. Nephrologists are medical doctors. In order to become a nephrologist, one must first obtain a bachelor’s degree wherein they complete the prerequisites for medical school, including courses in biology, chemistry, physics, and calculus. Just about any major may be chosen as long as the prerequisites are also met, but traditionally, biology is the major of choice for aspiring physicians because all of these courses are included within biology major programs. After obtaining a bachelor’s degree, one can then go on to medical school, which takes about four years, and then complete an additional residency in internal medicine. After schooling is finished, then one must pass a certification exam and obtain a license to become a doctor. Nephrologists may work in many different settings including hospitals, private practice, health clinics, and universities. They interact directly with patients in order to diagnose and treat them. Many patients with kidney problems are older, chronically ill, and have other medical complications. Those with end-stage kidney failure may be close to death. Nephrologists work long hours in a potentially stressful and emotionally challenging position, but the work of treating patients and even saving their lives is extremely rewarding. For those who are interested in nephrology but are not interested in becoming doctors, there is a variety of other career options available. Nephrology researchers work in a laboratory setting and often study nephrology diseases using animals such as mice. Nephrology nurses care for patients and assist doctors. With less training—usually a bachelor’s degree or associate’s degree—one can become a dialysis technician. Technicians operate dialysis machines, perform maintenance, and interact directly with patients, including taking measurements and keeping patient records. n.a. (n.d.) “History of Nephrology.” Massachusetts Medical Society. Retrieved 2017-06-20 from https://resident360.nejm.org/content_items/419. n.a. (n.d.) “How to Become a Nephrologist.” Doctorly. Retrieved 2017-06-20 from http://doctorly.org/how-to-become-a-nephrologist/. n.a. (n.d.) “What is a Nephrologist?” DaVita. Retrieved 2017-06-21 from https://www.davita.com/kidney-disease/overview/treatment-overview/what-is-a-nephrologist?/e/6884. Ciolek, Justyna, et al. (2017). “Green mamba peptide targets type-2 vasopressin receptor against polycystic kidney disease.” PNAS. Published online before print 2017-06-19. Trachtman, Howard, et al. (2014-09-18). “The grand challenge of nephrology.” Frontiers in Medicine 1:28.